Piercings of all sorts are growing in popularity, especially tongue piercings. This type of piercing can be done in a variety of styles, but you're not limited to a single style of jewelry even if you get a common midline piercing. You'll have plenty of amazing choices. Piercing professionals use different tongue rings according to how you get your tongue pierced. The midline piercing is the one most people get. With this piercing, a hollow needle is inserted in the middle of your tongue about 3/4 of an inch from the tip. It is set on a slight angle so the ball of the jewelry won't hit your teeth. The best starter ring for this piercing is a 14-gauge, 7/8-inch straight barbell made from surgical steel, 14K gold, bioplast or acrylic. Once the tongue heals, you can usually transition to a 5/8-inch barbell. In addition to getting your tongue pierced in the middle, you can also get it pierced along the right or left side of the tongue. The technique and starter ring used are similar to the midline. Some people choose the option of going with side placement for second, third, or fourth tongue piercings for a unique look. You know that little veiny web underneath your tongue? Well, that is the frenulum or frenulum linguae. As long as you have enough available space, your piercer will typically place the hollow needle through the center of the frenulum and insert the ring. The jewelry that fits this area is generally a circular barbell made from a non allergenic material. However, you could choose a curved barbell instead depending on your preference. 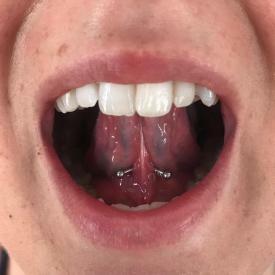 The venom piercing, not to be confused with the snake bite, consists of two smaller holes which are placed on the right and left sides of the tongue close to the tip, but they can also be placed vertically if you prefer. It's called a venom piercing because it mimics snake fangs. Starter rings for this piercing are made from standard surgical steel, 14K gold, or bioplast barbells to avoid an allergic reaction. The initial barbell used is longer to facilitate healing, but it can be replaced with a shorter bar because the size of the bar will depend on the area of the placement. 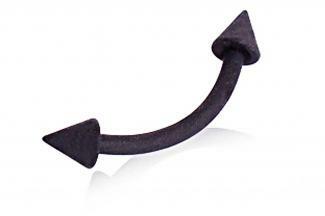 For example, a piercing done closer to the tip might require a shorter bar. Your piercer can help you choose your jewelry once you decide on a placement. The horizontal piercing goes right through the tip of the tongue using a slightly curved barbell. After inserting a hollow needle to create the hole, the piercer will place a 14 to 16 gauge barbell that is 5/8-inch in length or longer depending on placement. You can also get a vertical piercing right at the tip of your tongue. The hollow needle is used to make the hole directly at the tip, and this is usually created in conjunction with a healed midline piercing. Since there's a lot of movement in this area, you should opt for a softer barbell like bioplast or a captive bead ring made from non allergenic metal. Tongue rings can be made from several materials, and each has its uses. Surgical stainless steel is the most preferred metal for piercings because it seldom causes allergic reactions or additional irritation at the piercing site. A particular type of stainless steel known as 316L is of especially high quality and very resistant to corroding, so many people prefer to purchase rings made from this material. 14K or 18K gold is a good choice for any piercing whether it's fresh or healed. This is another metal that seems to cause very few allergic reactions. Titanium is another fine-quality metal, but some people find they have a reaction to it so it's seldom used until after a fresh piercing has healed. Teflon, or polytetrafluoroethylene (PTFE), is used in the manufacture of flexible rings. Acrylic is a great body jewelry alternative for anyone who is allergic to metal. Acrylic rings may be solid plastic, or they may be made from acrylic layered over stainless steel which produces a piece that is durable without causing a reaction. Dental acrylic is processed differently than standard acrylic which strengthens it and makes it safer for the tongue. This material can be sterilized in an autoclave without harming the jewelry. Bioplast is a metal-free alternative that flexes with your body movements. It may improve healing times because it is non-stick, and lymph does not collect around it. It is also heat resistant and can be cleaned in an autoclave. Warning: It is possible to damage your teeth with your jewelry. Be sure the piece you choose gives you a comfortable fit and be very careful about chewing until you get used to wearing it. The jewelry you wear on your tongue offers endless opportunities to show your unique personality. If this is your first tongue ring, there are several popular styles you should consider. The standard metal barbell is, by far, the most popular type of ring. It comes in a variety of colors, like white, black, pink, etc. You can also find it in a variety of materials, like surgical steel and gold. For example, you can buy a surgical steel, 14G standard barbell in gold tone, rose tone, black or steel for about $6 on Amazon. This lightweight gold-tone ring is comfortable to wear and nickel free. The jeweled, straight barbell is another favorite. This design is very similar to the standard barbell, but the ball that's supposed to be worn on the top of the tongue has a jewel imbedded in the metal to give your tongue a little bling. This ring comes in a variety of styles. You can get a jewel imbedded in the bead or purchased a disc shape jewel that is slightly flatter. 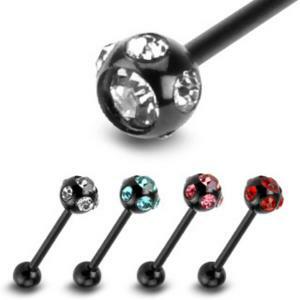 For example, FreshTrends Body Jewelry offers a multi-gem, surgical steel, straight barbell. This jewelry has a 4mm bead and a 16mm length and sells for about $13. For people who want a little flare in their ring, the straight barbell with a design is a fan favorite. This ring has a straight metal bar, but the beads which attach to either end have an intricate design on the ball such as stripes, colors, hearts, and more. The options are practically endless. 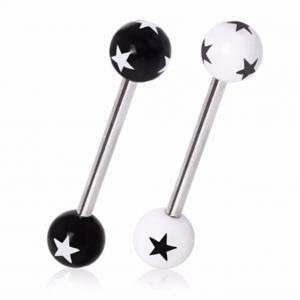 For example, the classic marble barbell sold at Body Candy is available in 316L surgical steel for around $2. The red marble ball has white swirls and is made of acrylic. The captive bead ring is yet another popular style for piercings at the tip of the tongue. This ring closes with a bead at the end of the hoop which flexes with your tongue. If you are looking for something in gold, you can find a 14K rose gold captive bead ring at FreshTrends Body Jewelry. This 18G, 1/4-inch long ring is available for about $50. If you typically walk off the beaten path, the popular styles might not cut it for you. Therefore, it's a good thing body jewelry companies can meet your needs here as well. Barbells come in numerous designs and sizes, including skulls, frogs, cherries, dragons, flowers, etc. You can even find rings with your favorite swear words! If you can name it, you can probably find a barbell bead to match. For example, this cherry-shaped ring is available in 316L surgical steel in 14, 12, or 10 gauge. It's available from FreakRings.com for anywhere from $7-8. If you enjoy skulls, you can find a 14G, 5/8-inch, surgical steel barbell with a jeweled acrylic skull for $4 on Painful Pleasures. Maybe you want a hoop on your tongue, but you don't want to add an extra hole. Using a doorknocker barbell can add a bit of flare to your jewelry without the extra piercing. The doorknocker is a hoop that attaches to the bead at the end of the ball and gives the appearance of an additional ring. You can also have jewels embedded in the end of the ball for extra color. These rings come in singles as well as doubles. 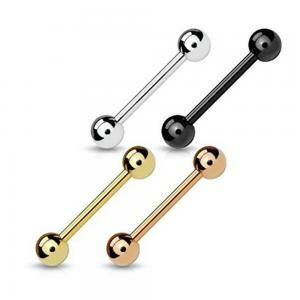 You can find a 14G, surgical steel barbell in a 5/8-inch length at Body Jewelry.com for about $16. You'll definitely get noticed if you have studded or spiked beads on your ring. These beads or balls are typically acrylic, bioplast or silicone, and they have some give to them. While you can find them in plain metal and single colors, you can get wild with neon greens and pinks as well. For example, you can get a 14G, neon spiked barbell tongue ring with a silicone top ball and acrylic bottom ball from Body Candy. The bar is made from 316L surgical steel, and the piece sells for $4. Found in all different types of materials, UV barbells have beads which react to UV light. The next time you're at the club with one of these, you can stick out your tongue and show off. For example, Amazon offers a clear acrylic, UV-reactive barbell for $9. This is a 14G piece with a 16mm bar length. A TongueVine is actually more of an accessory than a ring. It is worn with your tongue jewelry, and it allows you to wear additional studs without punching more holes in your tongue. These vines are made from surgical-grade silicone which makes them fairly comfortable and hypo-allergenic. Painful Pleasures offers a TongueVine for as low as $7, and each unit is made from 316L implant-grade stainless steel. 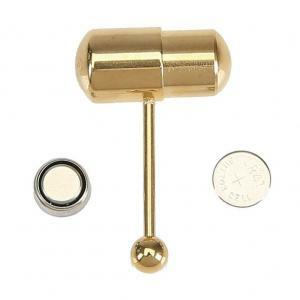 With this device, you can customize captive ends in 14G. If you want to add a little variety to your under-the-tongue piercing, you can use the spiked, curved barbell to grab some attention. This ring is typically made of softer material and is designed for the eyebrow, but it fits the space nicely. It comes in an assortment of colors which might strike your fancy. One example of this style is the 16G, 3/8-inch, neon yellow barbell from Body Candy for $5. This ring is made of surgical steel and can fit multiple body piercings. While many people get a tongue piercing because they like the way it looks; some people get one hoping to add more spice to their love lives. To that end, here are two big sellers. If you thought spinners were just for kids, think again. You can add a spinner bead to your barbell for extra excitement. This bead has two spinners attached to it which move on the tongue. Each spinner is slightly spiked and can roll. 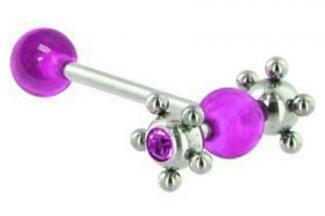 At Amazon, you'll find the purple gem spinner barbell in surgical steel for $14. This item is 14G and 5/8 of an inch long, and it has UV acrylic beads. Vibrating tongue rings are just that. They have a little mechanism on the bead which vibrates when switched on. Each ring comes with a key which lets you turn it on and off as you please, and it operates with watch batteries. At FreakRings.com, you can get the Thrasher LIX in 316L surgical steel with a glow-in-the-dark, neon yellow Koosh ball for $22. This item is supposed to provide over an hour of fun and claims to be one of the most powerful vibrating rings on the market. As you can see, this type of body jewelry offers a lot of variety, and there are too many styles available to mention them all. Depending on your needs, the barbell is definitely the go-to piece of jewelry for most people with tongue piercings. Now take a trip to the mall and find some rings that really fit your own personal sense of style.